While training clients on Monday morning I watched the cover on our deck table and chairs billow up like a hot air balloon; to the point I was afraid the protective cover would tear. With wind gusts forecast to get up to 80 MPH, I wasn’t at all surprised to see this happen. It wasn’t until later in the day when I went upstairs and looked out my laundry room window that I realized that the incredibly heavy stone-top table had been blown across the deck. 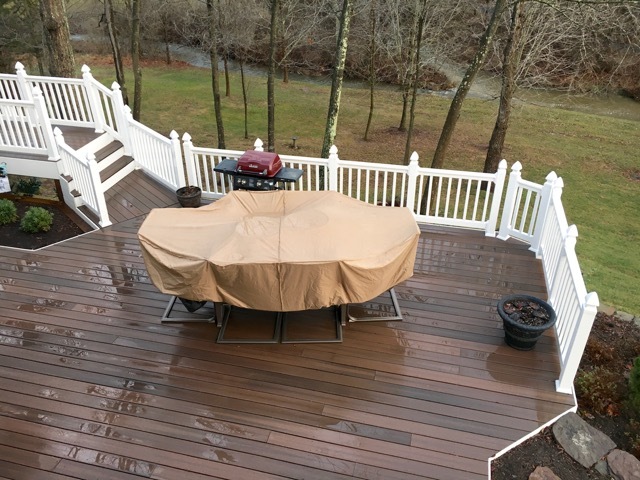 Prior to the windstorm, it was aligned parallel with the decking boards. I mention the high winds because Tuesday was forecasted to be a repeat of Monday so my friends and I all showed up for our run over-dressed and had to shed our jackets as we ran. 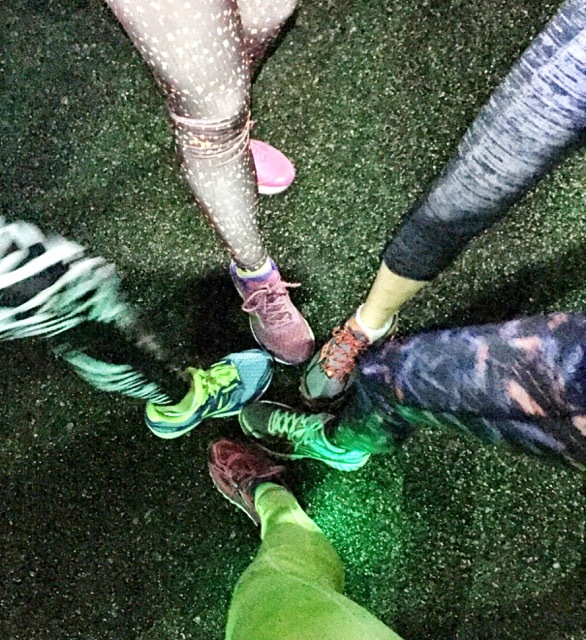 We did; however, rock our fun and colorful tights without shedding them! Thursday’s run back on the W&OD Trail was uneventful without any skunk sightings this week (we meet at a different location for each of our three runs per week and almost always see skunks on this trail). We’re starting to pick up our pace and push each other a little more. Most of our recent runs are at a sub 9:00 pace and our Thursday runs on the straight trail (more accurate GPS readings perhaps?) have been in the 8:20 to 8:45 range, with some splits at 8:00 or slightly faster. With my slightly faster paces, I’m starting to notice residual back “awareness” after my run. With my back history, I know that I need to listen to my body (stay tuned for this week’s Wednesday Word) and perhaps slow my pace down to a 9:15-9:30. 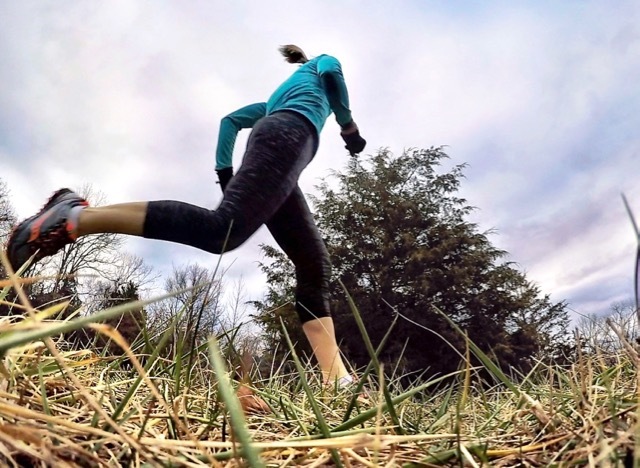 It can be frustrating to have the desire and ability to run at one pace, but know that it would probably be better not to… This instance is one of the few times that my age actually bothers me. 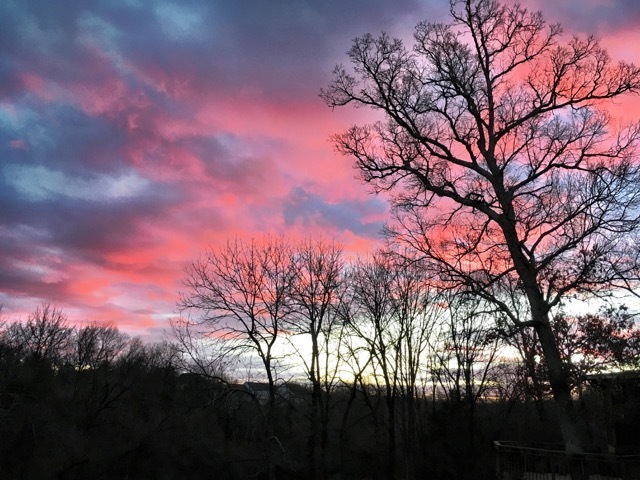 Friday morning’s weight lifting session was temporarily interrupted by this beautiful sunrise when I ran outside to capture it’s beauty. On Saturday morning I showed up to run with my MRTT friends, but no one at my pace showed up, so I ran alone. I hadn’t brought my earbuds along so I ran with my music blaring out of my iPhone speaker inside my SPIbelt (affiliate link) – yes, I was that person. I either passed the other runners quickly or met them coming toward me so nobody had to run along side of me listening to my racket. 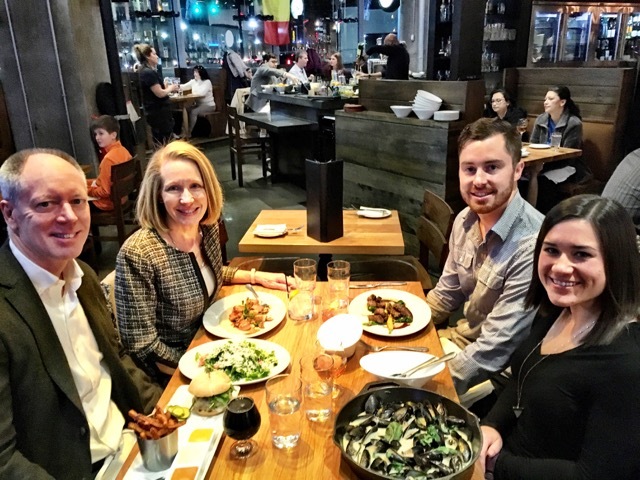 Saturday evening we had dinner with Daniel and Jess at Mussels Bar & Grill in Arlington (celebrating Daniel’s birthday a little early). We walked to and from the restaurant from Daniel’s house while scheming about our fall race schedule. No Ragnars for us this fall, but I hope we’ll be able to run a race together. Dinner was incredibly delicious (I got scallops), but let’s talk about the appetizers! We ordered calamari (a family favorite) and roasted Brussels sprouts. The Brussels sprouts also had spearmint and cilantro tossed in, making for a delightful surprise. I am now on a mission to try my hand at making them again, something in the past I’ve always struggled with – I either roast them too long or not long enough and they never even remotely taste as good as the ones I order in restaurants. Do you ever have to slow your pace to prevent some sort of pain? Well, I’m naturally slow. 🙂 I have had times with IT flare ups where I’ve had to be careful of pace, and since I sometimes run with faster friends, I have to be careful not to do it too much too. It can definitely be frustrating! I play my music like that on my bike sometimes because it’s not really safe to wear headphones. I don’t think anyone else really hears it though. You know I am all about fun tights! Too many favorite appetizers…but probably good old-fashioned tater skins are at the top (with plenty of sour cream on the side). All of those tights! Totally beautiful!!!! Don’t even get me started on the whole music without earbuds thing. It’s so rude. I also get annoyed with people who talk on their phones via speaker. As if we want to hear their conversation! It happened to me at Whole Foods this morning. Twice. What the hell? Yes, that would be incredibly annoying. I’m sorry to hear your back is uncomfortable. I deal with that too on occasion. And yes, I’ve had to slow my pace for certain issues. I guess it’s better than not running at all, right? You captured a gorgeous sunrise on Friday. Funny how we have kids with the same birthday! We ate Hibachi style tonight to celebrate. Thanks for linking, Deb! Doesn’t it stink to have to slow down for your back when your legs and brain want to go faster? Your deck is lovely! Years ago we had a wind storm here and I forgot to take the umbrella out of the table and it blew into the glass an broke it. that was quite a mess to clean up! The other day when I was running on the trail I forgot my headphones so I listened to my music just from my phone. I passed only a few people on my run and they didn’t seemed to be annoyed by it, thank goodness! Oh no – what a bummer that your table broke! We used to have a glass-top table and I was always afraid it would blow over and the glass would break. Funny thing is, the fabric seats dry rotted and they started ripping until eventually they were all ruined and had to be thrown away. I do this stop what I’m doing to take in a great sunrise or sunset, I’m not even partial to either one. Both are great in my opinion! We have Brussels sprouts often especially when we camp, we eat so much better when camping for some reason. Please tell me your Brussels sprouts secrets! That’s funny that you want to keep up with someone (or slow down as you’re passing to stay with them) so you can hear the song until the end. I love it!